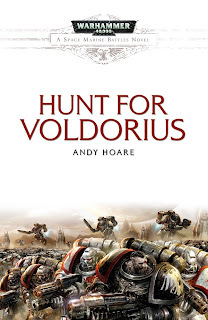 The third installment of the Space Marines Battles series Hunt for Voldorius by Andy Hoare is my latest review and already a favourite of my collection for a great story, riveting characters and battles that are worthy of the sagas they earned in the book. The book opens with the Master of the Hunt Kor’sarro Khan and his Hunters dropping onto Cernis IV, for a decade they have hunted the vile Daemon Prince Kernax Voldorius of the Alpha Legion across the galaxy and finally they have managed to run him to ground, or so they think. After chasing down the Daemon and confronting him and his Alpha Legion pawns at a promethium refinery the battle is revealed to be a trap orchestrated by Voldorius’s champion, the Alpha Legionnaire Nullus, who slays the Company Champion Brother Jhogai in a duel and flees, leaving the White Scars at the mercy of a mighty kraken released in the trap. The White Scars are able to escape the trap however and believed to be dead by Nullus and soon after Voldorius, they re-double their efforts and track the Daemon to the planet Quintus V, where the corrupt planetary officials have welcomed Voldorius and his ilk in exchange for power. Meanwhile a lone woman, Malya L’nor is chosen by Voldorius to be his new equerry and despite her revulsion at such a task, her faith in the Emperor allows her to withstand the evils of the Daemon Prince and plot behind his back to aid the Space Marines against him. The White Scars arrive on Quintus and are greeted by the Raven Guard 3rd Company, under Shadow-Captain Kayvaan Shrike who has been operating secretly on the planet for several weeks, and despite bad blood between their Chapters both captains agree to work with each other against the Alpha Legion. However Voldorius plots to re-create his greatest work, to reawaken the mythic Bloodtide, and once this legacy of the Dark Age of Technology is unleashed, the world of Quintus and all its people will bleed. The battles in the book are very well-written and both chapter’s styles of combat are reflected, the Bike-mounted charges of the White Scars in tandem with the aerial assaults of the Raven Guard are both great to read and since its rare to see Space Marine bike squads it was a nice treat to see the White Scars doing what they do best. One very interesting thing introduced is the White Scars battle-cant. Rather then broadcast what they are doing the White Scars use assortments of their own words in place of orders, while meaning the direct orders. ‘The silvered moon enshrouds the hunted,’ or ‘We hunt as the dawn-bat soars over the mountain,’ and ‘As the moon swoops,’ are examples of the intricate battle-cant that Andy Hoare has created for the White Scars. Knowledge of Chogoris and its steppes, it ways of life and its people are essential to the battle-cant and it can vary greatly from user to user. A very innoventive device for the White Scars and something to set them apart from other Space Marines. The Bloodtide is also a very ingenious creation, rather then go down a more obvious route like a dangerous Daemon or Warp-crafted artefact, Andy Hoare has taken the creative high-ground and created a unique archeo-tech weapon from the Dark Age of Technology that stands apart from the technology of the 41st millennium and makes other devices look primitive. A nano-machine based weapon the Bloodtide is designed to infest people and upon vocal command can exsanguinate them. Use of this ancient device to bleed over a trillion innocents earned Voldorius his Daemonhood, and it is a shame that we wont see this mighty device again, but hopefully more Dark Age relics are not far off. High Point: Three high points are present in this novel. The first is Kor’sarro Khan’s duel with Nullus on top of the wrecked Daemon-engine Ironsoul. It is here that Kor’sarro realises Nullus’s true identity as the Kagayaga, a dreaded Daemon from Chogoris’s legends that was banished 10,000 years ago by Jaghatai Khan before the coming of the Emperor. Nullus’s death by new Company Champion Kergis was fitting for a warp-spawned creature as himself and his halberd weapon was quite inventive. The second high point was Scout-Sergeant Kholka’s single shot against Voldorius. Just as the Daemon Prince is about to inject Malya L’nor with the remnants of the Bloodtide Kholka is about to shoot her and spare her more suffering, but a single shard of rock upsets his aim and sets it on Voldorius’s wrist. One single vengeance round that destroys the plans of Kernax Voldorius and aids in the final destruction of the Bloodtide. Kholka’s deeds will be remembered as well as his death at Voldorius’s hands for a thousand centuries, and as long as a single White Scar remembers his name. The third high point was the final duel between Kor’sarro Khan and Kernax Voldorius. Although Voldorius quickly gains the advantage Kor’sarro is able to bring down a statue of the Emperor upon Voldorius, and saves Malya L’nor from being crushed by the falling rubble. As soon as Voldorius rises he is impaled by Shadow-Captain Shrike’s Lightning Claws and forced into the remnants of the Emperor’s statue, the Master of Mankind’s blade pinning Voldorius in place, allowing Kor’sarro to behead the Daemon and end the decade long hunt. Low Point: Though im not that good at identifying low points in a novel i’d say that the lack of fighting against the Alpha Legion was somewhat disappointing. It was mostly cultists and forced militia units that faced the Space Marines and it was not until 3/4 of the book that the Alpha Legion got involved. However the battles with them were great and I suppose that the smaller numbers of them make them even better. 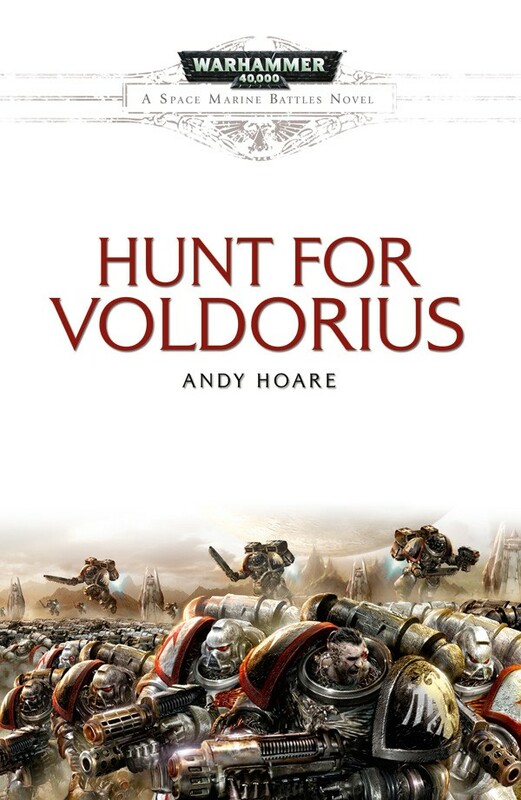 I give Hunt for Voldorius a 9/10 for an engrossing story, well-constructed characters and ingenious additions to 40k lore and to the White Scars chapter as a whole. I look forward to Andy Hoare’s next work Savage Scars. And as the ending notes that one day Nullus and Kernax Voldorius would return to haunt the nightmares of man, I hope we have not seen the last of them.